The core of the Sun is hidden inside a mantle made mostly of Iron (Fe), covered with a surface veneer of Hydrogen (H). 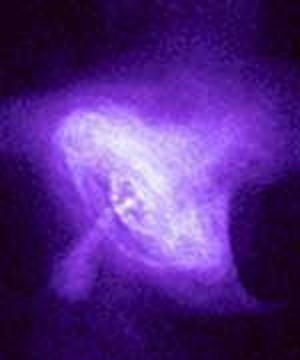 The core probably looks like this Chandra x-ray image of the pulsar that was formed in 1054 AD by the supernova explosion that produced the Crab Nebula. The core emits neutrons, which quickly decay to Hydrogen. Mistaking this "smoke" from this nuclear furnace at the Sun's core as its "fuel" caused the "Solar Neutrino Puzzle." Elements made deep in the supernova - Iron, Oxygen, Silicon, Nickel, and Sulfur - blanket the Sun's neutron star and account for its bulk composition.